↑ "Bush Orders Intelligence Overhaul". The New York Times. Associated Press. July 31, 2008. ↑ "Executive Order 13470". Federal Register. National Archives and Records Administration. July 30, 2008. สืบค้นเมื่อ November 22, 2016. ↑ Miller, Greg (May 21, 2010). 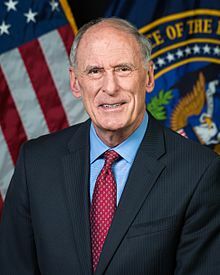 "Dennis C. Blair to resign as Director of National Intelligence". The Washington Post. สืบค้นเมื่อ June 3, 2010. หน้านี้แก้ไขล่าสุดเมื่อวันที่ 24 ธันวาคม 2561 เวลา 02:12 น.